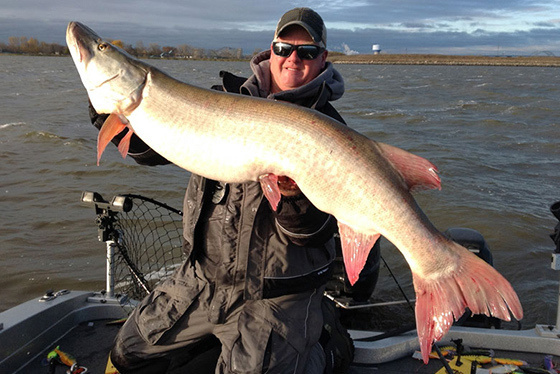 With Halloween just around the corner, now’s the perfect time to load your boat with monsters – monster muskies. In lakes with big populations of perch or shad, the best trick for treating yourself to a record esox this fall is trolling Rapala Super Shad Raps. The tactic is so effective on Green Bay, it often yields multiple 45-plus-inch fish per day. And that’s just as true on Green Bay as on any number of Midwest lakes known for great muskie fishing. Constructed of super tough African Abachi wood and rigged with heavy-duty hardware and 3X VMC® hooks, Super Shad Raps features the same fish-catching action of the original Shad Rap® in a super-sized presentation. They’re 5 ½ inches long and weigh 1 5/8th ounces. Alexander trolls Super Shad Raps in 4 to 12 feet of water, mostly over sand and mud flats. In water temps of 65 to 70 degrees, he trolls at 3.7 to 3.8 mph. At 60 to 65 degrees, he trolls at 3.5 to 3.6 mph. When water temps cool to 55 to 60 degrees, he slows to 3.4 mph. In water temps of 50 and below, he slows to 3.3 mph. Alexander employs planer boards and down-rods to troll a spread of multiple Super Shad Raps, of differing colors, at different distances behind the boat (which puts the baits at different depths). Once he catches a couple fish, he will switch his lines to the color and depth that’s been productive. On Green Bay, Perch and Fire Tiger are usually the color patterns that catch the most muskies. Those colors should be productive on any fishery with a large perch or shad population. Alexander trolls Super Shad Raps on a 100-pound-test Sufix® Performance Braid main line with a 4-foot 80-pound-test Sufix Fluorocarbon leader. “I also run a 1-ounce inline weight to help stop floating weeds from hitting the lure,” he says. Every Super Shad Rap is hand-tuned and tank-tested to fish perfect right out of the box. They feature a natural swimming action at any speed and stainless-steel through-wire construction. Don’t wait to try out Alexander’s Super Shad Rap muskie trolling program – Autumn is one of the best times to boat a monster. Watch Alexander troll Super Shad Raps for monster muskies here. Click here to read how one of Alexander’s partners at Alexander Sport Fishing Guide Service trolled Super Shad Raps to treat his clients to 7 muskies in one day – a 51 ½ incher, a 55 ½ incher and a 56-incher.